Poetic Poppies is one of the many works created by Jennie Tomao-Bragg, a New York born artist who’s been painting for more than 30 years. She received an Award of Excellence for her artistry from the Pittsburgh Institute of Art and her paintings are very collectible. Her magnificent landscapes are highly sought after, as are her traditional paintings of children and women in imaginative settings. Poetic Poppies shows her mastery of still life. The poppies are so real you’d swear that you should water them from time to time. The control of light is equally brilliant. It’s evident on the vase itself, which is bathed in natural light. Even the cloth covering the table is richly detailed. 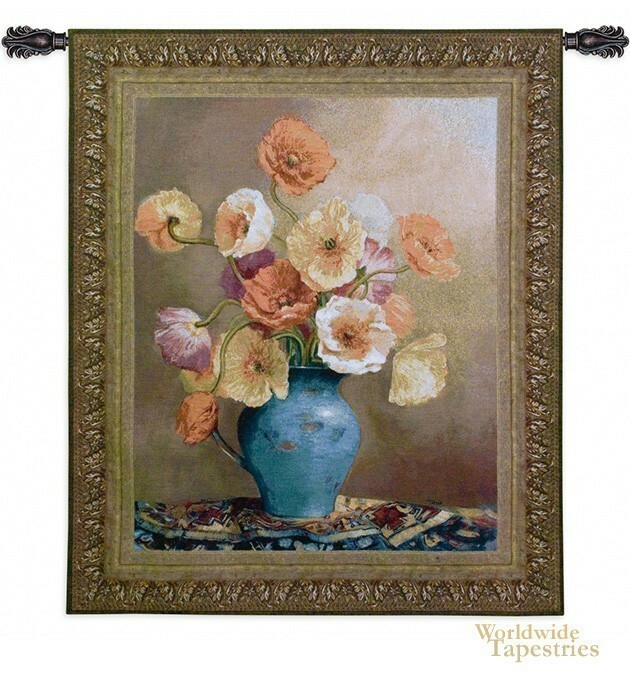 This wonderful tapestry comes fully lined and has a tunnel for easy hanging. Note: Tapestry rod and tassels (where pictured) are not included in price. Dimensions: W 47" x H 53"